Have you ever heard the phrase “born in the purple”? As in “Have you seen the photo of the latest addition to the royal family yet? He’s a precious prince born in the purple!”? It’s an expression used for children born into a royal or high ranking family, stemming from the Byzantine times, where royal Children were born in a designated purple room. Purple has been associated with royalty and wealth for centuries, as in the olden days it was one of the most expensive and rare colours one could gain possession of. Back then it was made out of a certain type of mollusk that could only be found in one region of the Mediterranean sea.Nowadays, it is way easier to make purple things, the association with royalty and exclusivity persisted though. But what other associations can purple create? And how can you best use it for your company? Nowadays purple does not only lead to associations of luxury and power. Over the years the color gained recognition because it was used in conjunction with magic and represented both wisdom and creativity. When used for the right brand’s colours, all of these connotations can have a positive impact on buying behavior. purple as a main colour in their logo? It is definitely not one of the most common colours used, partly because its sense of selectivity can feel excluding to certain people, but also because it is usually either liked, or disliked by people. Still, there are a few major brand which successfully took that leap of faith (or conducted sufficient customer discovery beforehand 😉) to use the colour in their logo. Major examples are the web service provider “Yahoo” and the British confectionery company “Cadbury”, the later, having picked the purple as a tribute to Queen Victoria, is now using it for their high class chocolate products. As the balancing colour between blue and red, using a slightly different hue of purple can make a big difference in the way the colour is perceived, making it a challenge for brand designers to get it exactly right without it creating a feeling of unease due to an unbalanced mix of red and blue. Here’s an example how we used a deep purple in the Logo and Social Media Backgrounds for our clients Bristol Beauty School. Of course all those different purple tones and their respective meanings can be also used in web-design, making the website viewer feel a sense of luxury and mystery. Lighter purples are great as background colours, as they give a clean, creative-feeling canvas to build a page on. Having brighter tones of purple in your colour palette can be beneficial if you want to use them as highlights in texts or background for buttons. They are usually used in moderation though, as to not overwhelm and possibly scare away the viewer with their rather strong aura. Purple is also very mesmerizing though, so especially in the last few years a more bold use has started to enter websites, as web design grows more brave and breaks more former taboos, making nearly everything possible. With the right designer and thorough planning more and more platforms also incorporate full blocks of deep purples into website backgrounds without it repelling visitors. Paired with otherwise very minimalistic design, this can lead to an easily recognisable, very luxurious and elegant feel of the website. In nature, originally, there are very few purple objects, mostly flowers and the odd animal here and there. That is one of the reasons why using purple in photographs usually works as an intuitive way to guide the viewers’ attention. 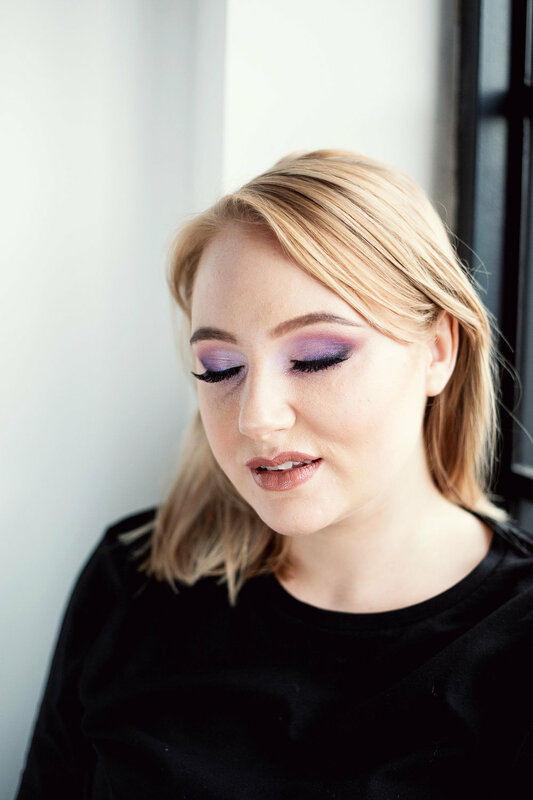 Being this rather uncommon colour, purple objects unconsciously draw our attention to them so if there are purples in your brand colours they can be a great tool to use for your photoshoot by incorporating the them in your clothing choices, flower arrangements or even as a makeup colour. Despite them guiding the attention, they still possess all the qualities mentioned above, so especially wearing purple clothes gives off a very luxurious, exclusive and high-class feeling. Purple can help you be many different things, it needs to be used with a lot of consideration and skill though to actually give off the right message. If constructed right it can become an amazing asset for your brand to immediately be perceived as high-class, powerful and sophisticated, capturing viewers attention and making you stand out from the crowd. Get our bi-weekly value-packed newsletter with the latest web design, photography, branding and marketing trends and exclusive studio insights delivered straight to you. We respect your privacy and will never send you spam.